This workshop seeks to engage in a mapping and analysing exercise of the recent history of LGBT+ struggles in Turkey at a time of aggravating crises. Our starting point is the often-cited assertion that Turkey has been an exceptional case in its geopolitical neighbourhood in the sense that it was a mostly Muslim society and heir to the Ottoman Empire, while at the same time broadly, if in a loose and contested fashion, integrated into the institutions and cultural discourses of the liberal West. An imperial history of non-heteronormative identities and the lack of anti-homosexual legislation—decisive in the post-colonial Arab nation-states of the region as well as in neighbouring Communist states—contributed to the impression that Turkey might be a case unto itself, also in the area of LGBTQ+ struggles. This thesis became all the more compelling, as LGBTQ+ civil society gained unprecedented visibility and societal power in the late 1990s and early 2000s. While the assertion of Turkey's exceptionalism requires a critical deconstruction, we do believe that the relative free spaces of LGBTQ+ mobilisation in the three decades beginning from the late 1980s are facing a severe onslaught from the interconnected phenomena of authoritarianism, social conservatism, and neoliberalism. The workshop will therefore approach the question of Turkey's LGBTQ+ struggles—understood in a broad sense ranging from identity-based political movements to everyday life, modes of socialisation, knowledge and artistic production—through these five phenomena mapped on to the following axes of inquiry: citizenship, ethnicity and religion, class and social status, political ideologies, culture and space. We will also ask whether and how teleological discourses and engagements of Europeanisation and its inherent liberal conceptualisation of LGBTQ+ identities have obscured the view of societal trends that may explain the speed with which achievements of the LGBTQ+ movement have been lost under the conditions of neoliberal authoritarianism. The workshop will take place on 18 May 2019 at Sabanci University's Minerva Han building in Karaköy. Based on the proceedings, we are planning to prepare a special issue in an SSCI journal, whose editors have already welcomed our initial proposal. 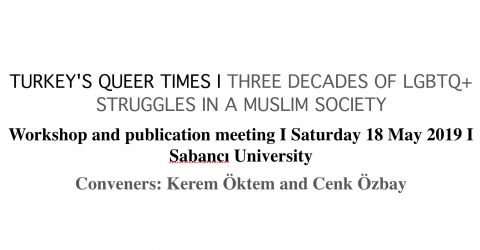 Interested authors are invited to send their application material to: turkeysqueertimes@gmail.com. Please submit the following information in one word file: Title and one paragraph abstract, one paragraph CV, full CV, and a declaration whether you will need funding to attend. The deadline for submissions is Sunday, 10 February. Selected participants are expected to submit a 2000 word extended abstract, or an early draft paper by April 19. Timely submission and readiness to publish is a precondition for the participation. Limited travel and accommodation funds are available for selected participants who cannot secure funding from their home university.